Red is the most challenging colour to play with, experiment, or venture into. But, in all honesty, red by itself can be a bit harsh. You need to pair it with colours that simmer it down but also complement it beautifully to bring out the best of your outfit. There’s no limit to what you can do with a red cloth. We have some ideas we’d like to share. Take a look! It might seem run-of-the-mill combination, but it looks uber chic when done right. However, don’t go for bold reds and blacks because it looks pretty shoddy. Go for a mild tomato red when you want to wear black. Red and blue can be a classy combination if you have the eye for it. Yellow and red is probably not the first colour combo that came to your mind. But, you can sport it as long as you do it cautiously. 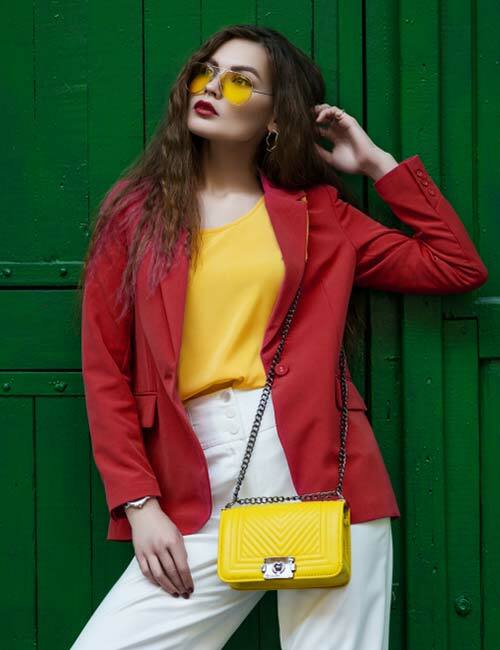 You can start with subtle details like a yellow clutch, pumps, or accessories with a red outfit. Or, wear a yellow tank top under a red blazer, or vice versa. The next time you take out that plaid skirt or shirt from your closet, resist the temptation to pair it with black or white. Go for a muted red shirt or tank if it’s a skirt or a ruffled miniskirt if it’s a shirt. Gray is a foolproof colour for formal wear. You just can’t go wrong with it. The cool tone of gray lets the red pop out and do all the talking. You don’t have to look like a Christmas tree to pull off green and red. You can be stylish at it. Combining different hues of red is a whole new ball game. It gives you the opportunity to create a bespoke outift with pieces you already have in your closet. These crimson red pants, red leather jacket, and black turtleneck do just that. Extremely stylish but not loud at all. Here’s another Parisian street style look you can try. Wine red is a beautiful hue that has a grandeur vibe like no other colour. Pair a teal blue dress with a red overarching jacket and red pumps to up the ante of your look. You can pair red with its closest neighbours on the colour spectrum like candy pink, peach, hot pink, or rouge. If it’s a two-piece outfit, go for a red bottom and play around with the top. Are you stepping out in a black and white outfit? You know there’s still scope to pop some red in there, right? Honestly, there’s not one right or wrong way to wear red. But, if eccentric is not your go-to style, tread a little cautiously. I hope you get the drift.